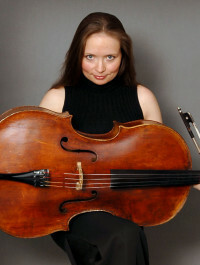 Marie Hallynck (born 1973 in Tournai, Belgium), may be considered as one of the most outstanding cellists of her generation and has been present in prestigious halls such as the Amsterdam Concertgebouw, the Vienna Musikverein, the Wigmore Hall in London, the Théâtre de la Ville and the Cité de la Musique in Paris, the Palais des Beaux-Arts in Brussels, Symphony Hall Birmingham, Philharmonie in Cologne… In 2000, she played her debut at the New York Carnegie Hall as well as the Philharmonie in Berlin, where she was re-invited for the following season. She played as a soloist with about 50 orchestras all over Europe, in Turkey, in the US & in Korea, among which St Petersbourg and Rotterdam Philharmonic Orchestras and the Amsterdam Concertgebouw Chamber Orchestra. As a chamber musician, she plays with musicians such as Vadim Repin, Martha Argerich, José Van Dam, Cédric Tiberghien, Ronald van Spaendonck, Gérard Caussé, the Danel Quartet, the Talich Quartet, the Prazak Quartet, the Ysaye Quartet, Alexander Melnikov, Bruno Pasquier, Janine Jansen, Misha Maisky, Renaud Capuçon, Julian Rachlin and Muhiddin Dürrüoğlu with whom she founded the chamber music ensemble Kheops. Marie Hallynck studied in Paris with Reine Flachot, Janos Starker in the U.S. and Natalia Gutman at the Musikhochschule in Stuttgart. She received numerous national and international awards (Brussels, Ghent, Paris, Eindhoven, and others), and is laureate of the famous Eurovision-Competition. In 1992 she received the highest awards at the Maria Canals Competition in Barcelona, the Mozarteum Salzburg, and the Accademia Chigiana in Sienna. In 1996 she became a Laureate of Juventus (an association which each year selects the most promising talents – from eighteen to 26 years old – all over Europe). In 2001, the Association of European Concert halls, selected Marie Hallynck as “Rising Star” and the following year, the Belgian Music press awarded her the “Soliste de l’Année” (an award she now shares with other renowned musicians such as Gidon Kremer, Antonio Pappano and Philippe Herreweghe). Amongst her recordings, let us quote a few: the Cello concertos by Vieuxtemps and Jongen (with the Belgian National Orchestra conducted by Theodor Guschlbauerand R. Kofman – Cyprès), her recital CDs together with Cédric Tiberghien with the complete works for cello & piano by Schumann and Grieg (Harmonia Mundi) and sonatas by Debussy, Britten & Bacri (Fuga Libera), a recording dedicated to D. Shostakovich released by Alpha, and two CDs with her Kheops Ensemble, featuring the Beethoven trios for clarinet, cello & piano and both Dohnanyi and Penderecki sextets. She received lots of awards such as “Five stars” in Diapason, “Joker” in Crescendo, “Choc” du Monde de la Musique, “Incontournable de l’année 2004” by Arte for her recordings. Marie Hallynck is Professor at the Royal Brussels Conservatory and was a jury member at the famous ARD competition in September 2010. She plays on an instrument by Matteo Goffriller from 1717.